Scotland has not created the UK’s debt, but we have to pay for it. Every year the Westminster Treasury deducts a sum from Scotland’s block funding grant to pay for a share of the UK’s rising debt, none of which Scotland ran up. In the latest figures the amount removed from Scotland budget was £4.02bn or 33% of Scotland’s deficit in 2012/13. If Scotland had been an independent country for the past 33 years (as the UK debt mountain grew) Scotland’s higher revenues would have meant that we would not have had to borrow a single penny. In fact Scotland would by now have a cash surplus of at least £50bn. All of the UK debt was generated outwith Scotland. Over 33 years Scotland has subsidised the rest of the UK by paying interest on loans we didn’t take out. This enormous subsidy from Scotland adds up to nearly 72 thousand million pounds (at the point of writing this blog) and that subsidy is growing at approximately £127.00 per second (see above). The press have ignored this, but there is no debate about the figures; they have been sourced from official government reports. Two think tanks – Business for Scotland and the Jimmy Reid Foundation – have published research that proves these figures to be correct. Please share this on social media or grab the code below to add the widget to your own website. 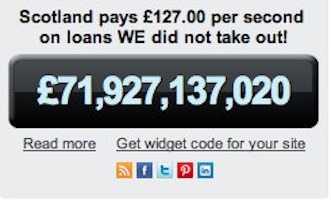 Cut and paste the code below to get a debt trick calculator for your site. 1) This £50 billion cash surplus has been described as a conservative estimate by the leading economics think tank the Jimmy Reid Foundation. The figures include the assumption that an independent Scotland would have made all the spending mistakes of Westminster such as having nuclear weapons and it also includes our share of the bank bail out cost – hence one of the reasons the figures are deemed conservative. 2) Scotland’s century of lost wealth This blog describes how prior the publication of reliable historic GERS figures (Scottish accounts, that go back to 1981/2) that Scotland still subsidised the rUK with higher per head tax generation and has done for a century. Scotland is England’s main pillar of support. The past is a very poor guide for the future. I bet Alex spends a lot of his time thinking if only I had bet on that horse that won. It’s always about Alex, eh? Don’t let the facts get in the way of a good rant…Better Together? I think not. Scotland is waking up thanks to this incredible website and others on the Yes side. The Union’s days are numbered! I apologise for my Alex rant in my 3rd sentence. I still say very emphaticaly – the past is a very poor guide to the future. What do you say on this point? Without the past, we cannot LEARN for the future is it not Donald/Bill? You are effectively saying that the exploitation of Scotland’s natural resources of the past and people is a very poor guide to the future. Do you realize this? Bill – then look at the future ! Four of the planet’s most highly respected and experienced economists – Professor Sir James Mirlees, Nobel Laureate, Professor Joseph Stiglitz, Nobel Laureate, Professor Frances Ruane, and Professor Andrew Hughes Hallett make up the Fiscal Commission Working Group. The Commission was created in 2012, and were asked to go away and look at all the available evidence, and produce a series of economic recommendations that would benefit both Scotland and rUK following a ‘Yes’ vote. They – as you’d expect leading academics to do – operated completely free of all and any political interference and influence. In Feb. 2013 they produced their 226-page ‘First Report – Macroeconomic Framework’. After studying the report, the Scottish Government endorsed it’s recommendations (Sterling-based currency union etc), and they became policy. The media not only ignored that and subsequent FCWG reports, it suppressed them for a year – allowing politicians like Ruth Davidson, Carmichael, Lamont, Alexander, and Osborne to claim that those economists were ‘delusional’, ‘economic illiterates’, and ‘fantasists’. During a couple of Holyrood debates, Davidson accused the Commission of writing it’s proposals ‘on the back of a cigarette packet’. That, of course, was because they thought (or did they ?) 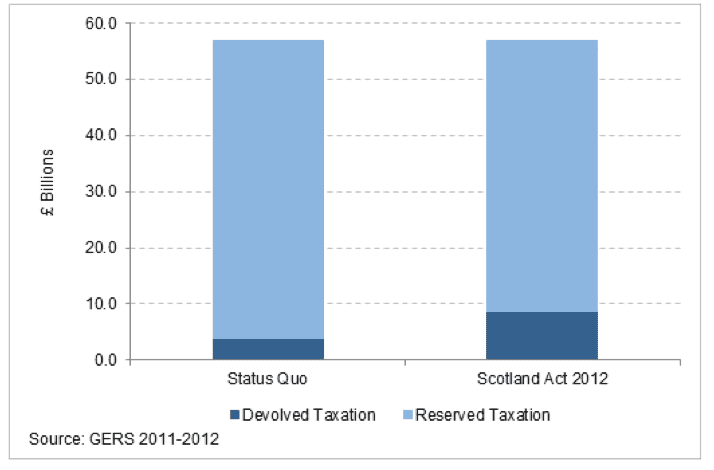 the Scottish Government proposals came from Salmond, Swinney, and a few civil servants. In recent months we’ve seen even more leading economists like Professors Leslie Young, Anton Muscatelli, David Simpson, Peter McGregor, Gavin McCrone, and others endorse the Fiscal Commission’s currency proposals – and for the same reasons. But the media – in particular BBC Scotland – still largely ignores what those fully independent, genuine experts have said. The proposals for TWO ‘Oil Funds’, an effective system of financial oversight (‘Fiscal Rules and Fiscal Commissions’), and a radical new tax system have also come from the Commission, and once again the media and BT have pointed dishonest fingers at Salmond and the Scottish Government rather than the ACTUAL source ! I remember the speech Salmond gave to BfS a few months ago. The media was there in force, but although half of that speech was about the work of the Fiscal Commission – what it is, who the members are, what it’s done and it’s recommendations – all mentions were edited out of the BBC coverage, and I didn’t see a single reference to the Commission in the print or broadcast media. The Commission’s work is all about the future. Some of the planet’s best minds and most experienced thinkers make up the Commission, and that’s why the media and BT refuse to even mention it/them. If the public found out the truth, all those political statements and Treasury reports would be exposed for what they are : Economic vandalism, nonsense, and poorly-researched, factually inaccurate work that would not be acceptable from a First Year Economics student (all things said by some of those economists named above) ! Bill – try listening to some of the shocking evidence given to the Holyrood Finance and Economic, Energy, and Tourism Committees. One session a couple of months ago had leading economists ‘look at the future’, and we heard Professor David Simpson predict that the £1.4 trillion (and rising)debt would turn the UK/rUK into ‘another Greece’ in 10 – 15 years time. The other two witnesses, Professors Gavin McCrone and Peter McGregor agreed with him. Those witnesses, and others like the NIESR’s Dr Angus Armstrong, Prof John Kay, Jim and Margaret Cuthbert, and (I think) Prof Jo Armstrong also stated that an independent Scotland is ‘better placed’ to deal with it’s share of that debt. The media is always present for these evidence sessions, but I’ve yet to see them actually report what is said. They will, however, pick out the one sentence from six hours of verbal evidence from seven witnesses that could be defined as ‘scary’ for an independent Scotland – and create ‘Project Fear’ articles around that single sentence. I keep hearing we are ‘Better Together’ because the UK has an economy of $2.5 trillion, divide this with the reported 63 million UK people – this results as 39682.539, while Scotland’s economy is only $250 billion with only 5.2 million people – the answer here is 48076.923. Am I missing something here, isn’t 48076.923 not larger than 39682.539!! Then what are you going to us to base your judgements on and use to guide your actions? Astrology? Tea leaves? Both are about as believable as unionist promises. There are repeating patterns in politics as there are in most spheres of human activity. Mind you if the past week has taught us anything its that people who dont lern from experience vote No. Very important that this gets wide coverage Gordon. I assume that you have a PR going out out to all MSM. Perhaps WoS with their new funds can get a full page spread in the main Scottish news papers. What are the YES campaign and SG doing? Watch FMQT yesterday and did not think that the finance questions were handled very well. Way too defensive. We also subsidise the BBC in Scotland who reward us with shamefully biased negativity.